A fragile Earth fighting for its very survival. After an unknown “Great Disaster” left in its wake a graveyard of a planet, a few hearty and resourceful human survivors struggled to make a home for themselves in a newly-wild frontier. One of these was Kamandi, the so-called Last Boy on Earth. Kamadi lives a rugged life of adventure and exploration. A dangerous existence for a boy, to be sure, but fortunately, he doesn’t have to face it alone. Kamadi’s accompanied by Prince Tuftan of the Tiger-Men, one of many intelligent, humanoid animals left in the wake of Darkseid’s machinations. 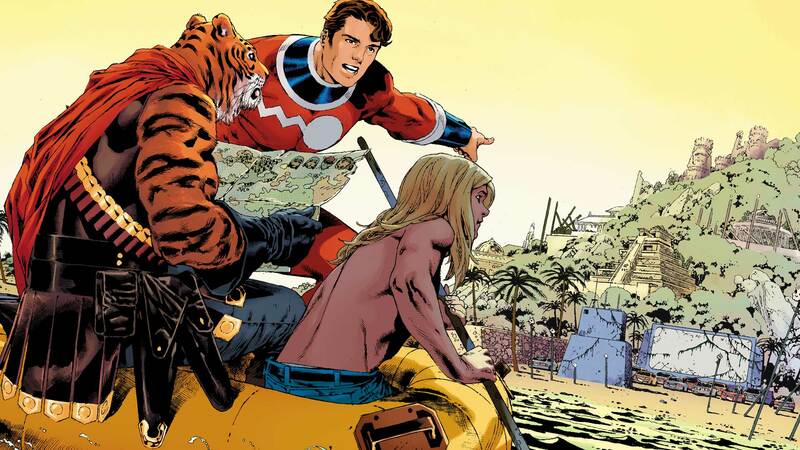 Tuftan travels with Kamandi, guiding him. They are also accompanied by Ben Boxer, an astronaut who is connected to the Brother-Eye satellite surveillance network, which allows him to become the powerful biOMAC within seconds. Though Kamandi and his compatriots don’t know it, they’re also living and rebuilding their civilization under the watchful eye of the New Gods. Like the ancient Greek Gods of Olympus, the New Gods can only indirectly influence Kamandi’s fate and the direction this reborn world will take. Their numbers include Highfather, chief of the New Gods; Lightray, who can harness the power of light energy; Avia, Queen of the New Gods; Fastbak, who travels at super-speed; Big Barda, the warrior and weapon master; and Barda’s husband Scott Free, aka Mister Miracle, an immortal blessed with super-strength and agility. After the suspenseful ending of issue #9, writer Greg Pak and artist Joe Prado bring our hero to the land of the Dead Worshippers! After the chilling ending of the last issue, Keith Giffen and Steve Rude transport us to a land where the Grecian sheep and the Wolf Garibaldeks are on the brink of war!